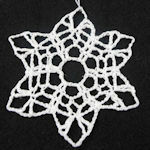 Vst Ball Ornament -- $1.99 A Crochet pattern from Julie A Bolduc. 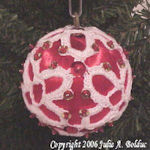 This ball ornament is made with a white satin covered 2 1/2 ball. 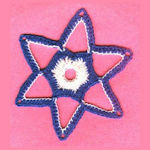 It is covered with a country blue crocheted mesh which has a combination of Vsts and ch 3 nets sts.